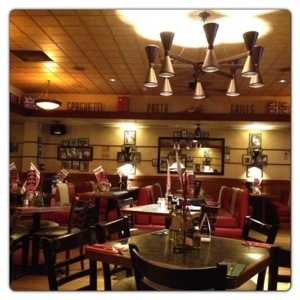 We are already a fan of Frankie and Benny’s, it is a family-friendly restaurant, perfect for a Sunday meal. 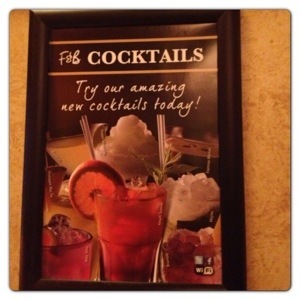 During the summer, we reviewed Frankie and Benny’s New Menu. 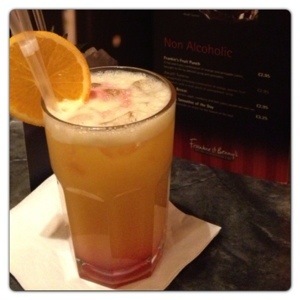 Recently we had the opportunity to review Frankie and Benny’s New Cocktails and we had a great experience. 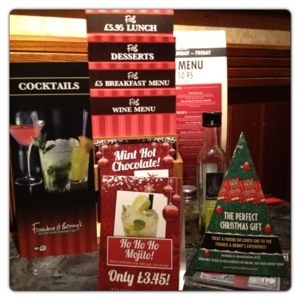 Frankie & Benny’s has already a wide range of dishes and four great new menus: breakfast, lunch, specials and desserts. Now they have launched a new cocktail menu, perfect to celebrate the beginning of the New Year and special occasions. We started our meal with a refreshing cocktail: hubby ordered Pineapple Mai Tai while I ordered a Ho Ho Mojito. Pineapple Mai Tai (RRP £4.95) is a long twist on the classic Mai Tai with Bacardi rum, triple sec, almond syrup, fresh lime and the addition of pineapple juice. 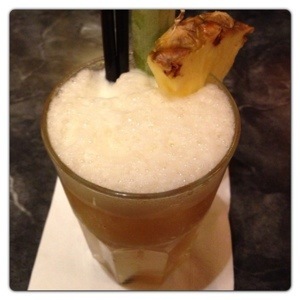 Pineapple Mai Tai is a very refreshing and fruity cocktail, hubby really enjoyed it! 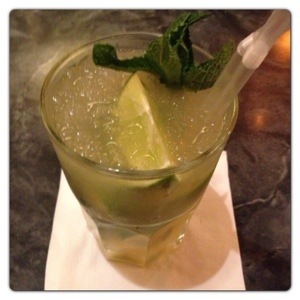 I tried Ho Ho Mojito (RRP £3.95) which is a Christmas version of the classic Mojito with gingerbread syrup. Ho Ho Mojito has Bacardi rum, fresh lime, mint, sugar and soda. Mojito is one of my favourite cocktails, however I wanted to try the festive option and i wasn’t disappointed. Ho Ho Mojito is a cleaver twist on the Cuban original cocktail. 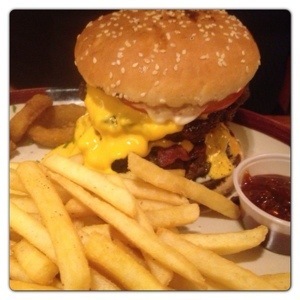 Hubby ordered a burger, Double Philly Stack (RRP £13.25) which is perfect for burger lovers! Double Philly Stack comes with two 6oz grilled hamburgers topped with Frankie & Benny’s own recipe pepper cheese sauce. It is piled high with crispy bacon, lettuce, mayo and spicy onion rings. It is served on a toasted sesame seed bun with house fries and tomato-chilli relish on the side. When Double Philly Stack arrived, I didn’t think hubby would be able to finish it, as the portion is quite generous. However hubby had it all and, according to him, he enjoyed every single bite! I love steaks, so I ordered an 8oz Larder Trim Sirloin Steak (RRP £16.95) with is an aged sirloin steak cut thick and served with roasted cherry tomatoes on the vine. The Sirloin Steak also comes with flat mushroom, a fresh rocket and Grana Padano garnish on the side. You can choose house fries, salad or jacket, and I ordered a salad with it. I also ordered peppercorn sauce (RRP £1.45) and corn on the cob (RRP £1.95) as side dishes. My Sirloin Steak was very tasty and cooked to perfection. The portion was generous and full of flavour. I asked my steak to be cooked medium and it arrived just as I requested. The dressing on the salad was very tasty too! 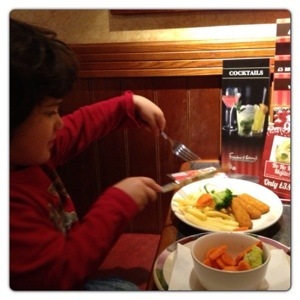 Frankie & Benny’s kids menu includes a main course, dessert and refillable soft drink for only £3.95. You can also choose a Junior’s menu for £7.55 for younger diners with larger appetite. Kid’s Meal also comes with an optional side of vegetables, side salad or baked beans and a fun activity pack with games and puzzles. The activity pack was brilliant when little man was waiting for his food, it kept him entertained and seated at all times. Little man chose fish fingers and chips with a side of vegetables for main course and brownie Sunday for dessert. As previously, he really enjoyed his meal and I was quite pleased with the portion of vegetables on the side. It comes with carrots and broccoli, so it makes the meal more balanced. Our cocktails were so lovely that we ordered another one. Hubby picked Almalfi Sunrise while I had Pina Colada. As hubby was driving, he chose a non-alcoholic cocktail. Almalfi Sunrise (RRP £2.95) is a delightfully refreshing combination of orange, passion fruit and lemon, with a vivid splash of pomegranate syrup. Hubby mentioned that his cocktail tasted lovely and he didn’t even miss the alcohol, it was lovely as it is. I wasn’t driving, so I picked another one of my favourite cocktails: Pina Colada (RRP £4.95). 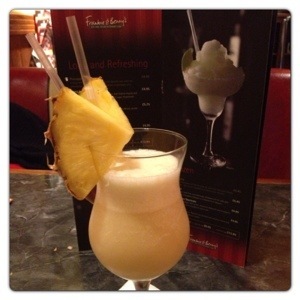 Pina Colada is a taste of the tropical and it reminds me of our summer holiday to Brazil. Pina Colada is made with Bacardi rum blended with coconut cream and pineapple juice. It was delightful, very tasty and refreshing! To finish off our meal, we had one of Frankie & Benny’s popular Sundaes.They are freshly prepared and served in a tall glass. Hubby chose East Coast Sundae (RRP £5.45), toffee and chocolate ice cream layered with chocolate covered honeycomb, mini marshmallows and chocolate malt balls, topped with chocolate sauce and cream. I chose Chocolate Fudge Brownie Sundae (RRP £5.45), vanilla ice cream and chocolate brownies smothered in chocolate fudge sauce, sprinkled with chocolate honeycomb and topped with whipped cream. 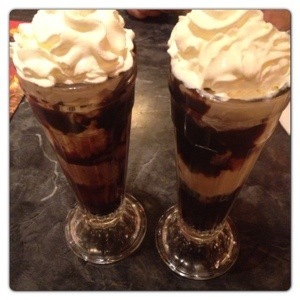 We both loved our Sundaes, they were a perfect ending to such a wonderful meal. 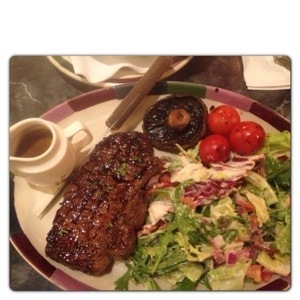 Overall, we thoroughly enjoyed our meal at Frankie & Benny’s, the staff at the Ilford branch were very friendly and helpful, the food was beautifully cooked and the cocktails were great. Thank you very much for having us and we should be back soon! You can follow Frankie & Benny’s on Twitter and Frankie & Benny’s on Facebook. We were given a voucher to visit Frankie & Benny’s for review purposes. However the opinions expressed in this review are honest and my own. 7 Responses to "Frankie and Benny’s New Cocktail Menu"